This breed is an American breed, which was discovered in Georgia, and was developed in the 18th century, for hunting purposes. A much loved breed, by farmers and hunters because of their speed agility and courage, they are capable of hunting in any weather and at any place. This breed is tough, muscular and robust because of their paws, they are able to swim, they have large eyes long floppy ears. This breed in particular has a certain air if arrogance about it, and sport a dominant look, which makes them different from the others. This breed of dog is loyal, energetic and affectionate, they do well with children and orders however, some precautions must be taken for small children, they are good with other pets and small animals. This breed is not advised to be used as a watchdog, as they can not recognize strangers,generally known to be sweet, energetic and reliable and make good family dogs. They have a single coat which is short, dense and glossy. Their coat sheds lightly. They are good learners and require basic obedience and socialization, in their early age. Training must be given to them with fairness and patience, they will not respond on any harsh and hard methods of training. 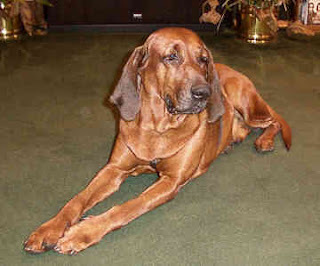 The Redbone coonhound is not recommended for apartments, as they need lot of exercise on regular basis, they love hunting, running and swimming. They enjoy being within a family and do best in rural settings. This breed needs occasional brushing and baths should be given to them, when its required, its important to check their ears and paws.